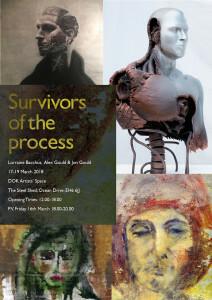 The title for this exhibition comes from a quote I read years ago by the sculptor George Fullard – that there is no such thing as a finished artwork, only survivors of the process. This philosophy appeals to me and my co-exhibitors, who are two of my nephews – Jon Gould a designer/artist and Alex Gould a sculptor. This will be the first time we have had such a family event and also my first show in Edinburgh. It is taking place at The Steel Shed, itself a survivor of the once thriving ship-building industry in Leith. The work we will each be showing all has a figurative quality but we have approached the human form in very distinct ways. My own process begins with the figure but then the materials take over, disrupting the surface so that the paintings appear provisional, as if entropy has begun. This sense of impermanence is what interests me. Alex describes his work as an expression of masculinity that could be thought of as out-dated and unnecessary but which continues to grow in popularity, with its references to bodybuilding, turbos, engines, superheroes, decay and destruction. Jon’s work ranges from interactive design to portraiture and animation, with a particular interest in personal identity in digital spaces. The PV is from 18.00-20.00 on Friday 16th March 2018, with the exhibition then running from 17-19 March, 12.00-18.00 each day. All welcome.